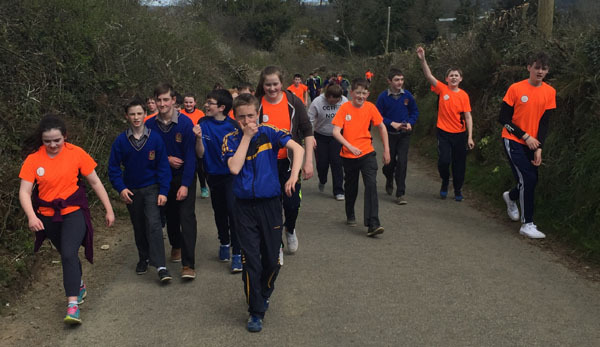 Last Tuesday, 26th of April, the students of St. Joseph’s College Borrisoleigh took part in a sponsored walk to raise money for the Cycle Against Suicide being held in the school on Tuesday 3rd of May. 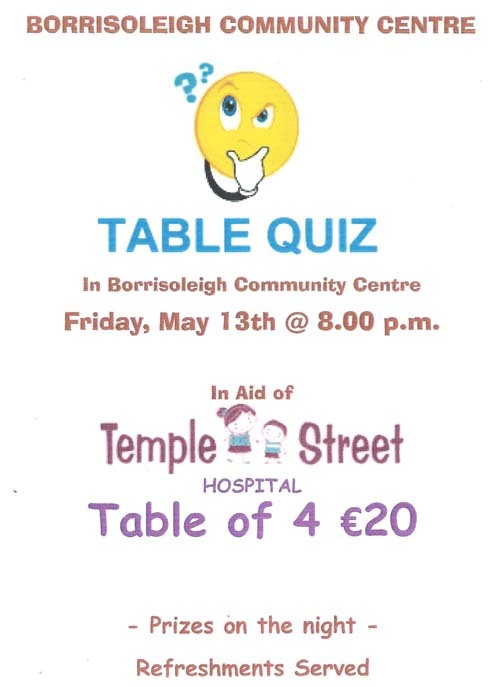 The students raised over €2000 for the organisation as St. Joseph’s College Borrisoleigh is an anchor school this year. Around 130 students took part in the walk and 10km run on Tuesday. It was a very good day as everyone promoted positive mental health and everyone had a thoroughly good day. On Monday and Tuesday the 25th and 26th of April, our Transition Years took part in a First Aid and CPR course. The class was instructed by Christine O’Dwyer and the students learned the basics of First Aid and how to use a defibrillator in times of emergency. Thurles Greyhound Stadium fundraiser for St Joseph’s College, Borrisoleigh A wonderful night was enjoyed by parents teachers and students at Thurles Greyhound track on Saturday 26 March where a bumper crowd turned up to support a fundraising initiative organised by the school and it’s parents association. 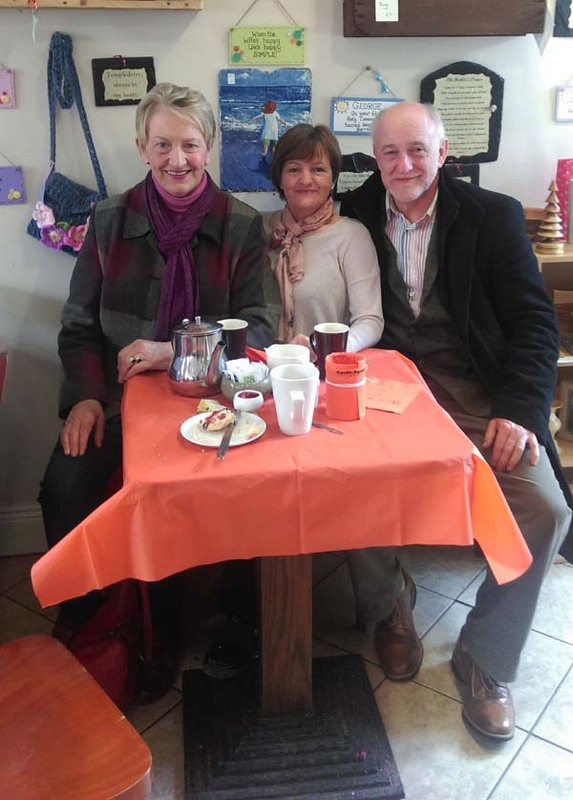 It was gratifying for all concerned to see the presence of so many past pupils who took the time out to keep in touch with friends that they had made from their time in Borrisoleigh. The local businesses of the area rallied behind the school to provide a huge array of sponsors and prizes for the evening. The 500 euro first prize for the buster draw was won by TY student Emily Meagher from Toomevara. 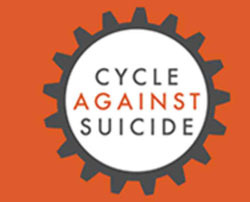 A novel take on proceedings was added when a novelty race run to raise awareness of the schools role as an anchor for this year “cycle against suicide” was run at half time. The entry was made up of a student representing the six academic class years from the college who brought their own pet dogs and ran them. It was preceded by a lively parade consisting of a pomeranian, two King Charles and three terriers. Commentary for proceedings was supplied by sixth year student Micheal Carey and Principal Kevin McCarthy. 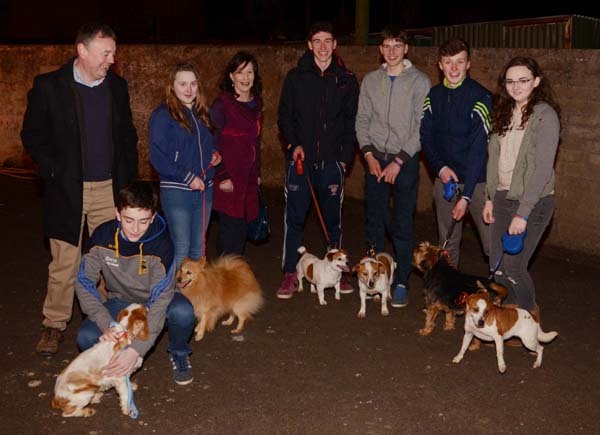 Borrisoleigh dog Prince handled by Thirds years James Ryan proved that all those years spent chasing local cars finally paid off. After the races, music was provided by local students who have formed their own band, Gan Ainm. 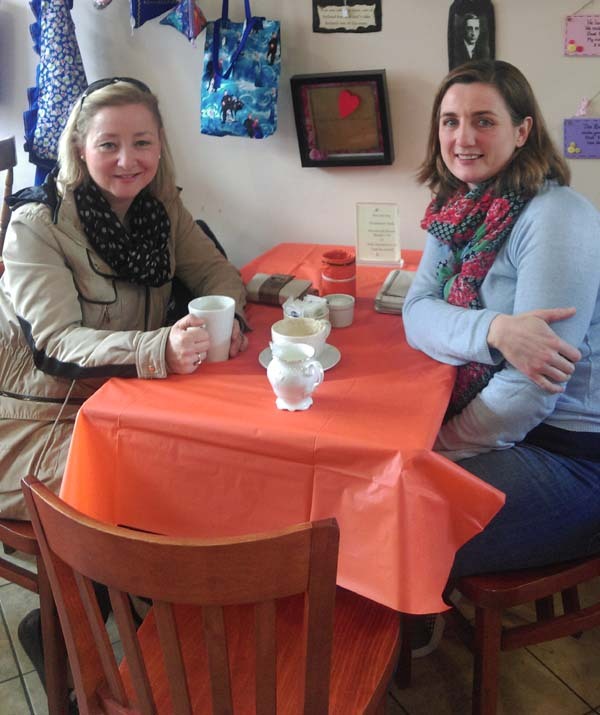 Refreshments were available and there was plenty of time to relax in the warm atmosphere that is enjoyed by the school community. A lovely evening provides school management with ample scope to continue to provide top class facilities for the next generation of pupils. 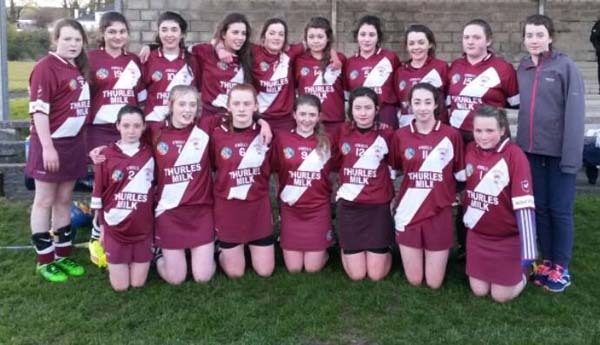 St. Josephs College u.17 progressed to the Fitzgerald Shield semi-final after a hard fought victory in dr. Morris Park on Tuesday the 26th of April. On a wet and windy afternoon, the team played against a strong breeze in the first half worked well collectively as a unit and were leading by a single point at half time. Goals by Alan Ryan and Nicky Cooney gave Borrisoleigh a strong advantage early in the second half before a lapse in concentration in our full back line led to Thurles hitting back two quick fire goals to cut the Borris lead to just six points. St. Josephs held out to win by a scoreline of 4-16 to 2-16. The final lecture of our season will be delivered by local man, John Connors. 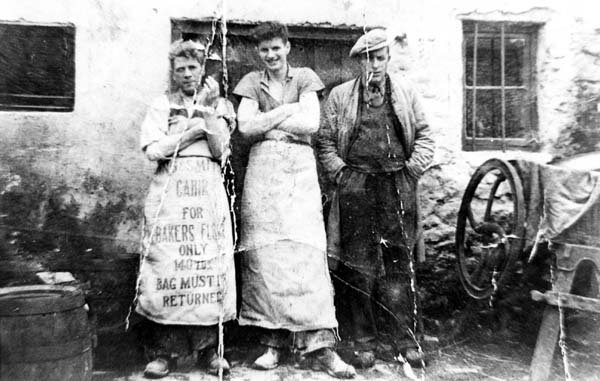 This lecture, titled, ”Revenge for Dwyer and The Ragg— related events and the wider story”, tells of the killing of Tom Dwyer of Bouladuff in March 1920. Like so much in our history, this incident did not happen in isolation. John’s lecture details the background to this killing, how the attempt to disarm two RIC constables in a public house was to have fatal consequences and the whole episode was to take on both a national and international significance. 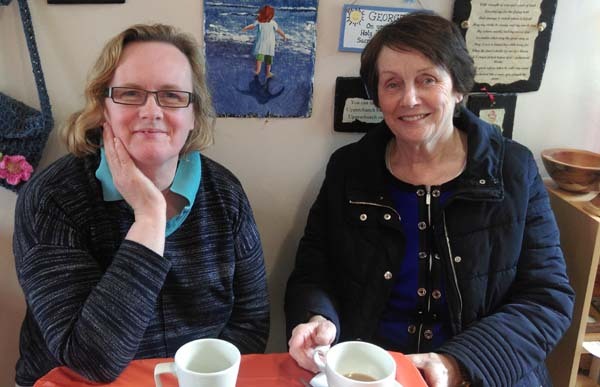 The lecture reveals the chain of tragedy that followed the man believed to be responsible for Tom Dwyer’s death and also continued to haunt his family long after the dust had settled. It shows how this single killing was to be the impetus for a further six violent deaths and it also illustrates the deployment of Black and Tans in Tipperary at that time. It was always generally accepted that they did not come to Ireland until later in April of 1920 but John’s research points to their central involvement in Dwyer’s assassination. John Connors has researched extensively on this period of our national history. He has lectured widely on many of the major incidents and personalities from that period. His unique style involves the telling of a wider story through the life or death of one person, placing as much emphasis on the loss and sacrifice suffered as on the undoubted bravery and heroics. He also gives due recognition to the members of the RIC and Crown Forces from this troubled period, giving them names and place of origin. 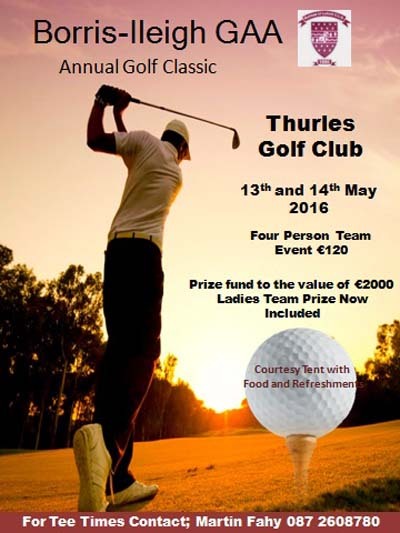 On Monday 9th of May at 8.30 p.m.
Scores: Kate Delaney 0-04 and Aoife Ryan 0-02. U16’s also played Kildangan at home on Thursday April 28th. This was a fantastic game, with each and every player putting in a great performance. 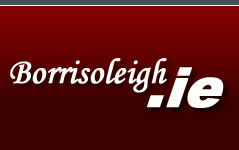 A win for Borris, with a scoreline of : Borris-Ileigh 5-05 Kildangan 4-03. Laura Maher 1-00 & Emma Doolan 1-00. Panel: Laura Young, Emma Doolan, Kellie Healy, Katie Boyle, Gretta Atik, Kate Delaney, Cliona O’Connell, Christine Delaney, Ciara Doolan, Maeve Stapleton, Laura Maher, Aoife Ryan, Sinead Ryan, Shaneen Stapleton, Alice Buckley, Eimear Fahey, Laura Hutchinson, Antoinette Atik. U14 fixtures will re-commence shortly, confirmation to follow. U12’s hopefully will continue the winning streak, next fixtures will be confirmed by text. 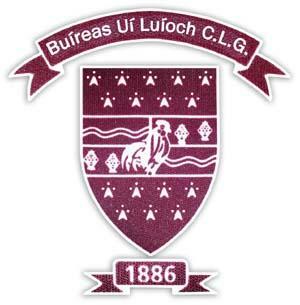 U8’s blitzes: May 7th, June 11th, July 16th, August 13th & September 3rd, also at the Camogie Grounds. There will also be Toddler races on the evening. Tom McGrath’s Team Hazel made all the decisive moves in the final round of the Snakes & Ladders Series which in turn brought them to square 94 and were crowned the Series Champions. Tom produced his best time to date on the night and he was also backed up with an excellent performance from Mary Ryan which earned them the necessary moves to earn the title. Their stars of the previous week were Evelyn Groome and Miriam Murphy and they and they also chipped in with impressive performances while the fifth member of the team, Lochlainn Hodgins can feel very happy with his consistent level of performances right throughout the Series. 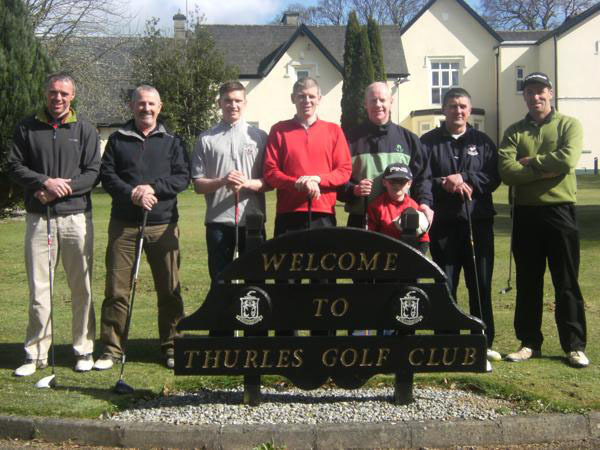 In second place overall and just 6 squares in arrears was Team Fir which was captained by Denis O’Connell. 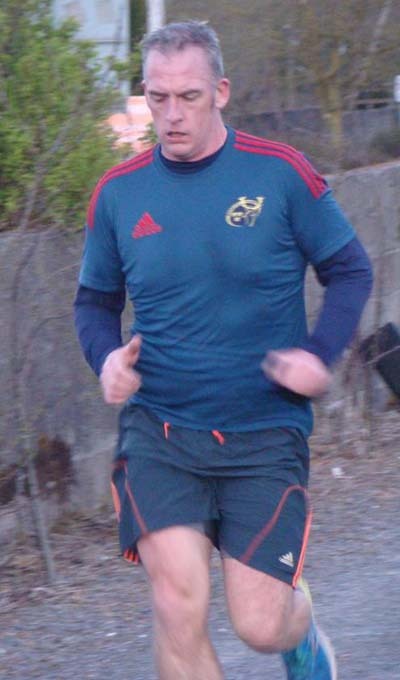 His team mates were Marie McGrath, Denise Gould, Patrick Groome and Delia Ryan. In the individual stakes, there was plenty of movement and we ended up with 4 first time winners. In the men’s grade, Ger Ryan hit square 98 to claim the title. Kevin Delargy kept the chase going right to the end where he finished on 91 while Alan Kelly finished on 83 and third place overall thanks to the luck of landing on a ladder on the final night. In the women’s grade, Matilda Hayes ruled supreme and was the only athlete to complete all 100 squares of the board. Matilda has shown superb levels of improvement in recent weeks and is a very worthy winner of the title. The podium was completed with a joint second finish by Mary Cummins and Edwina Ryan who both finished on square 93. The hugely talented Tom Delaney is the underage boys champion thanks to a 14 square haul on the final night to bring him to square 97. With a snake sitting waiting for the kill on number 96, if Tom had finished a single second slower, he would have dropped back into the pack. A great run by Tom and again fully deserved. In second place was the equally talented Eamon Groome on 87 while in third place was the hugely improved Patrick Groome on 83. 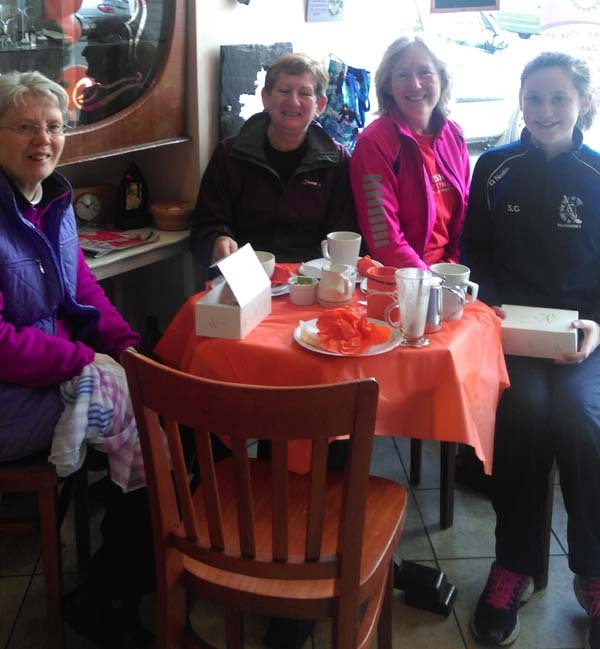 Emma Maher has shown terrific athletic ability over the course of the 5 weeks and her efforts were rewarded when she was crowned the underage girls champion. Finishing on square 48, she was 12 ahead of both Ella Ryan and Gabrielle Hodgins who both finished in joint second on 36. The overall Track-Attacker of the Series was won by the brilliant Therese Groome, a decision that few if any would disagree with. She was superb from start to finish and her levels of effort and determination each week were a joy to watch. Week on week she emptied the tank on the track and there is no doubting the sporting ability of the young athlete that is sure to have a bright future in her sporting endeavours. 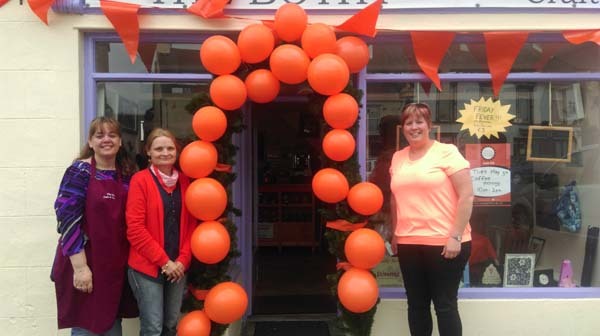 The runner up prize went to Templederry’s Edel Kennedy. 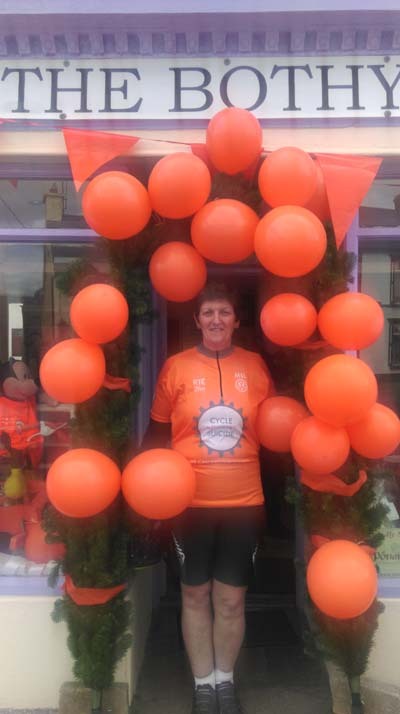 Edel had a superb Series in which she slashed her overall time for the 5km distance from 30:26 to 27:44. With the summer road racing now upon us, we will no doubt see further improvements in Edel’s times over the coming months. 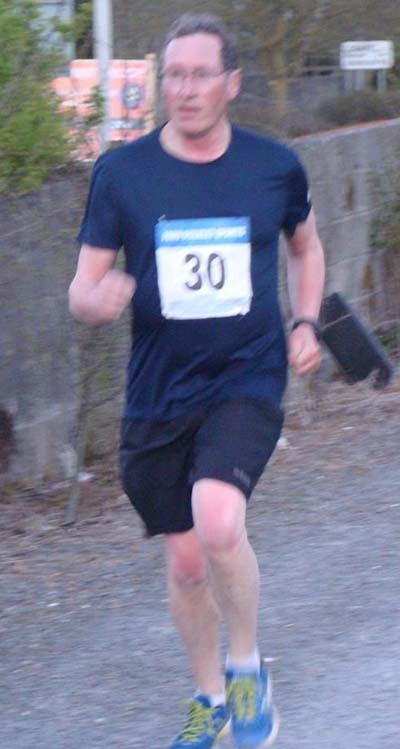 The third spot went to the fastly improving Kevin Murphy who with every outing is making terrific inroads into his overall times. A very consistent athlete, Kevin is another that we are sure to hear a lot more about over the coming months. 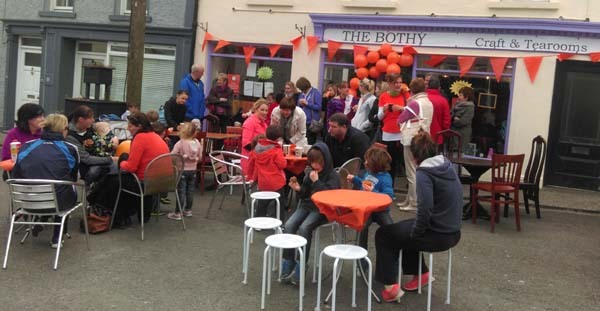 Saints All-Stars will be back again this year in the park in Borrisoleigh. Of course there will be a surprise for each child that signs up. all week from 10am to 2pm. The price is 50 euro per child and less if you have more than one child. My number is 086-3328697 to book or ask any questions. I will be around to schools soon to let the kids know! U6 Training will commence on Sat 7th @ 11:30am. We are looking forward to seeing new members on the morning. U8 Training on Saturday @ 11:30am. Text will be sent out to confirm time. 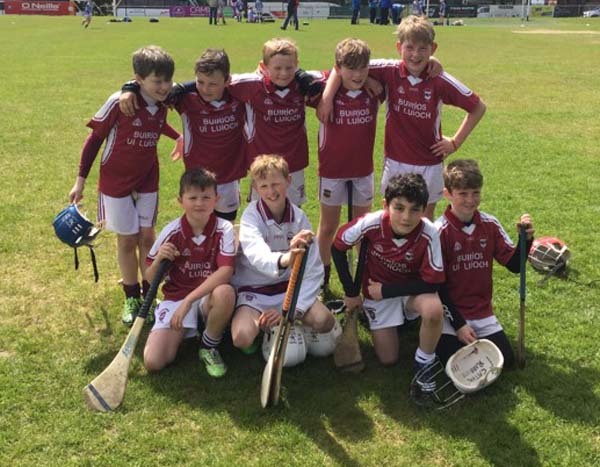 U10’s welcome Holycross-Ballycahill on Saturday @ 11am in the town park for a challenge match. This should be a great game. 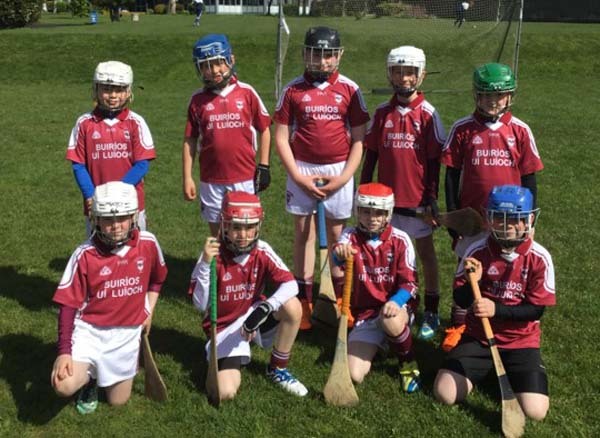 U11’s participated in a blitz in Dublin on Bank Holiday Monday. Na Fianna Hurling Club were running the blitz. We entered two teams and each team account for themselves highly on the day. Well done to all the lads that took part in the games. A great day was had by all. Thanks to Na Fianna for their hospitality. Community Games Competition takes place this Thursday evening in Newport @ 7:30pm. We are leaving the town park @ 6:15pm. Can you please reply to the text message that was sent out if unable to attend. U12 Training continues on Sat. Time to be confirmed. U14’s played Borris-in-Ossery on Sat evening last. Our lads put in a great performance but on the evening Borris-in-Ossery came out on top. Keep up the good work at training. U16 Training continues with good numbers attending. 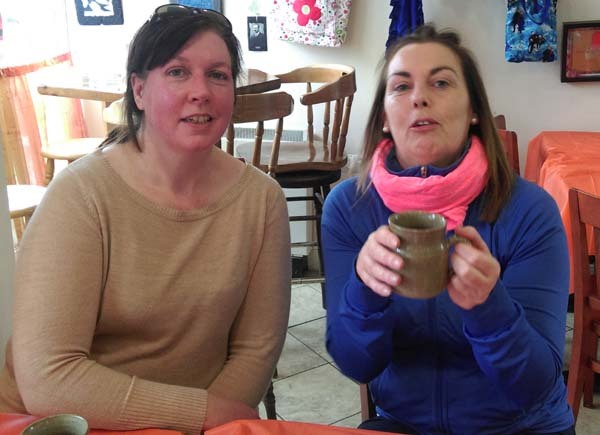 Youth Work Ireland Tipperary are looking to set up a Youth Club in Borrisoleigh. 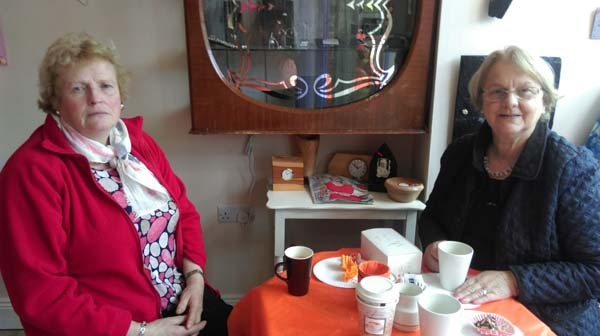 We are holding a meeting in Borrisoleigh Community Centre on Tuesday the 17th of May at 7p.m. 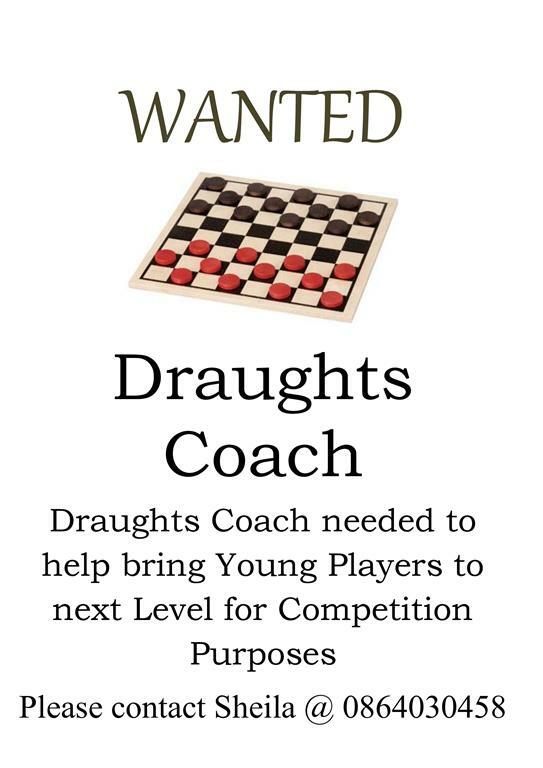 This meeting is open to anyone that might have an interest in setting up the club or becoming a volunteer with the club. 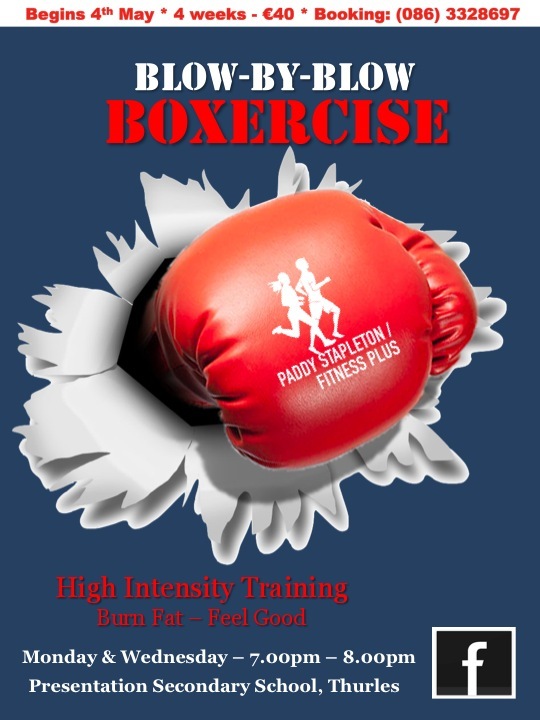 For more information please contact Donna McCarthy on 087 2860992. 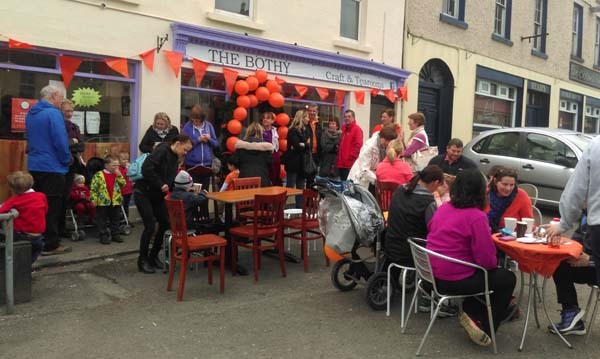 Thank you very much to everyone who donated confectionery, money and or their time on Tuesday for the coffee morning in The Bothy in aid of the cycle against suicide. We made an amazing €862.80. Donations are still coming in. The AGM of Borrisoleigh Scór took place in the Marian Hall on Wednesday night the 27th April. Borrisoleigh Scór had a fantastic year. In Scór na nÓg our solo singer Katie Shannahan won both the county and the Munster final. Katie was narrowly beaten in the All Ireland final. We are very proud to have a Munster winner of solo song in our parish. Also our Léiriú group won the county final and qualified for the Munster final. For the 5th year in a row our novelty act in Scór na bPáistí won the north final. Aoife Fitzgerald won the North B Final in recitation. 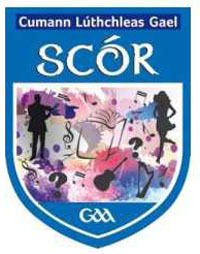 Our Léiriú group in Scór Sinsear won the county final. We will hold our adjourned AGM on the 24th August. In order for Scór to continue in our parish we need new members. Please consider becoming a member of our committee so that Scór can continue to flourish in Borrisoleigh.